In the inspection at Plymouth 6th April 1764 the Colours were listed as “2 – good” (as they were again at Edinburgh on 27th May 1768), but by the inspection of the 22nd May 1788 (24 years later) at Chatham they were listed as “Bad”. Each flagpole is ten feet long, tipped at the bottom with a small brass cap and at the top with a brass fenial in the shape of a spear head (the four quadrants being cut away) and tied with long gold (laced with maroon) cords ending in matching tassels. The King’s Colour is a silk Union Jack measuring six feet high and six feet, six inches in length. In the centre of which is the Prince of Wales’ “coronet-and-three-feathers” device. The Roman numeral “XXIII” in gold is in the upper quadrant closest to the pole on both sides. The King’s Colour is the senior of the two and should always be displayed as the right of the two. Neither Colour should be displayed alone. in the top corner, nearest the pole, the Union Jack with the Roman numerals XXIII in gold centered in the bottom corner, nearest the pole, the Red Dragon in a blue circle in the top corner, farthest from the pole, the Rising Sun device In the bottom corner, furthest from the pole, the “coronet-and-three-feathers” device of the Prince of Wales in a red circle. In the centre, the Prince of Wales’ “coronet-and-three-feathers” device with the motto “Ich Dien” (I serve). The “Coronet-and-Three-Feathers”, Rising sun”, and “Red Dragon” devices are the badges of the Prince of Wales. They were granted to the Regiment in recognition of its services in Marlborough’s campaigns, when in 1714, George I conferred the title of “The Prince of Wales’s Own Royal Regiment of Welch Fuzeliers” upon the Twenty-third. The “Rising Sun” is the ancient badge of Edward, the Black Prince, as Prince of Wales. The “Red Dragon” (Y Drag Goch) is the ancient Celtic badge of Wales (Cymru) from the myth and legends of the god Lludd (Lud) who became king of Wales. It was in these mystical times that Britain was oppressed by three plagues- the third of which was a “a shriek that came on every May eve, over every hearth in the Island of Britain”, and went through people’s hearts and so scared them that the men lost their hue and their strength, and the women their children, and the young men and maidens their senses, and all the animals and trees and earth and waters were left barren”. King Lludd sought the advice of his brother, Llevelys, then the King of France, who was a “man of great counsel and wisdom”. Llevelys explained that the shriek was raised by the Red Dragon of Celtic Britain who was being attacked by the White Dragon of the Saxons. Upon this counsel, Lludd measured the exact length and breadth of Britain and then dug a great hole at its centre (near Oxford). Here he placed a large vessel containing the best mead that could be made and covered it with satin so as to hide it. He later watched as the two dragons fought high in the air above the hole for a very long time. When they tired, they then fell down together on to the satin cloth, and, drawing it after them, sank into the mead below. Once they had drunk the mead and fell silently asleep, Lludd carefully folded them up in the covering and took them to Snowdon, where he buried them in a strong fortress near Beddgelert called “Dinas Emrys”. And after this the terrible shriek was not heard again until Merlin had them dug up, five hundred years later, when they recommenced fighting, and the Red Dragon drove the White Dragon out of Britain, foretelling of the day when a king of Welsh blood would sit upon the throne of Great Britain (Henry Tudor). Owen Tudor (Owain Tewdwr), King Henry VII’s grandfather, took a dragon as his device based upon the great Red Dragon of Cadwaladr ap Cadwallon, King of Gwynedd, his supposed Welsh ancestor. The Welsh dragon of modern days is red, but Owen Glendwr, who died in 1416, used as his standard a golden dragon in a white field. The Tudor dragon and the earlier Welsh beast were, however, often described as “fiery” or “of ruddy gold”, and manuscripts of the reigns of Henry VII and VIII show the Tudor dragon, both as a badge and as a supporter, with the head, back and wings of red and the under parts of gold. The “Coronet and Three Feathers” badge was taken at the Battle of Crecy (25th August of 1346) from the King of Bohemia by Edward of Woodstock, Knight of the Most Noble Order of the Garter, the Prince of Wales, eldest son of the Plantagenet King Edward III (later to be known as the “Black Prince”) at the age of only 16. The three ostrich plumes mounted in the Prince’s coronet surmounting the motto “Ich Dien” have remained ever since the token of the Prince of Wales. The Roman numeral “XXIII” refer to the Regiment’s seniority (23rd) according to the Royal Warrant of 1743 (although actually referred to much earlier) which stated that each regiment in the British Army was to take its rank from the date of its formation (or if raised in foreign service, its establishment on to the English Establishment). Thus, the Royal Welch Fusiliers were deemed the 23rd most senior infantry regiment in the British Army at the time. The first Colour of The Royal Welch Fusiliers in American was a King’s Colour made of rayon. At the time, no accompanying Regimental Colour was made. In 1975 the 23rd Regiment lent this Colour to the American State department for a bicentennial display in the Soviet Union. Unfortunately, this Colour was lost in transit and never returned to the Regiment. While on loan, Serjeant Peter L. Ford of the Grenadier Company had made and painted a matching rayon Regimental Colour. With the unfortunate loss of the original King’s Colour, the Officers’ Council decided that rather than replace the lost flag with another rayon one, to have made a matching pair of silk Colours (as that is the proper material from which they should be made). Mrs. Judy Mac Milan of Staten Island, NY was the seamstress for these new Colours. They were then painted by Susan Tylischek of Bridgeport, CT. In 1976, these new Colours were presented to the recreated 23rd Regiment of Foote, The Royal Welch Fusiliers in America at the Fusiliers Redoubt, Yorktown, Virginia by Councilor Captain S. R. Roberts, RWF. 2nd Lieutenants Joseph Gallant and Kenneth Seigel received the Colours by his hand before a borrowed goat from a local farm handled by acting “Goat-Major” Grenadier Serjeant Peter L. Ford, the massed Fifes and Drums under the direction of Drum-Major Kerry Joist, and the Battalion, Grenadier, and Light Infantry Companies under the able leadership of Major Thomas Pieper as well as before Brigadier-General Anthony Vivian, Colonel of The Royal Welch Fusiliers. These Colours were carried throughout the American bicentennial and were also with the 23rd Regiment when it marched before The Colonel-in-Chief of the Regiment, Her Majesty Queen Elizabeth II, and the other battalions of the Royal Welch Fusiliers at Powis castle, Wales on the 21st April, 1989. They have had a long and noble history, but age and wear have taken their tolls. So in May of 1996, just days after the 1st Battalion RWF had received their new Colours at Beachley Barracks in Chepstow, Wales, they were retired in a formal ceremony at Gunston Hall, Virginia. Brigadier-General (ret’d) Anthony Vivian, honourary Colonel of the 23rd Regiment then presented to Second-Lieutenant Lloyd Morris and Captain-Lieutenant Erik Goldstein a new set of Colours for the American Battalion. “The use of the Regimental Colours at events will be the decision of the Senior Regimental Officer present, after consultation with the other Officers present. 1) A nylon Union Jack with an embroidered center device of the Prince of Wales’ “coronet-and-three-feather” device was presented to the recreated 23rd Regiment of Foote by Mrs. Dorothy A. Edwards on the 3rd March 1979 in memory of her late husband. The flag had flown over the Fusiliers’ Redoubt at Yorktown, Virginia during his employment with the National Parks Service there and had been presented to him on the occasion of his retirement. Mr. Edwards had served in the Royal Welch Fusiliers during the Second World War. (This is item #01 in the RWFA Silver Collection). 2) A polyester blue flag with the applique of a red dragon and “23rd Regiment in America, Royal Welch Fusiliers” on both sides was presented by honourary Lieutenant-Colonel S. Reg Roberts (CLLR, Capt-RWF-TD) on the occasion of Saint David’s Day in Williamsburg, Virginia in March of 1987. (This is item #03 in the RWFA Silver Collection). 3) A 11 x 18 inch linen Union Jack which had been displayed in the car window of Adjutant Robert Gibney’s car throughout the Yorktown bicentennial celebration, was presented to the 23rd Regiment by retired Adjutant Gibney in May 1995 “in honour of all the members that had served the Regiment in the bicentennial celebrations (1975-1983). (This is item #85 is mounted on a wooden plaque in the RWFA Silver Collection). 4) A dark blue 33.75 by 51.5 inch nylon flag with a rampant Dragon over the letters RWF was presented by the 1st Battalion Royal Welch Fusiliers to “their friends and comrades in the American Battalion, the recreated 23rd Regiment of Foot, in appreciation for their ‘flag of friendship’ and appreciated support of the Regiment during its United Nations Service in Bosnia (1 March to 24 May 1995). (This is item #95 in the RWFA Silver Collection). 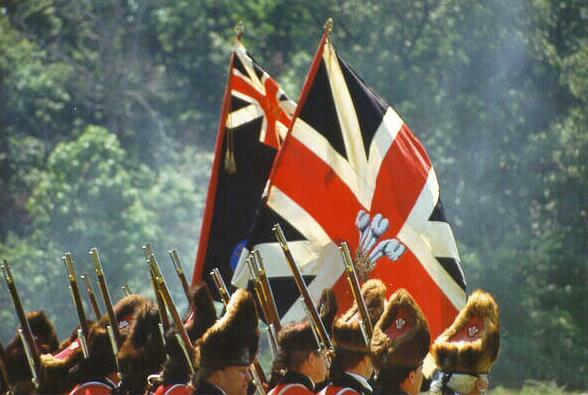 5) A Colonial “Grand Union” flag taken by the 23rd Regiment at Colonial Williamsburg, Virginia in 1999 and presented to the Regiment on St. David’s Day 2000 by Sergeant Morgan, Colonel’s Company RWFA.